Data is transferred and analyzed by external vendors. The whole should not last more than 30 seconds. Confirm or change your preferred country of delivery, language or currency. If you do this when logged in, your preferences will be remembered on your MZAccount. You can change them at any time by clicking the arrow at the top of the page. Take 2 pumps by mouth twice daily. Hold in mouth 30 seconds before swallowing. Repeat to desired dosage or as directed by healthcare professional. Take on empty stomach, at least 10 minutes before meals. May be stirred into small amount of water. Topical use: Apply a thin layer to clean skin (avoiding eyes) and leave on for at least 10-15 minutes. Refrigerate upon receipt. Use within 30 days of opening. If pregnant, consult physician before use. In case of traditional ascorbic acid along with the increase of the dose, there is an increased risk of undesired side effects in the form of gastrointestinal problems. Sodium ascorbate used in the preparation, contrary to pure ascorbic acid, it characterized with less acidic reaction and does not cause intestinal discomfort and consequently – it may be used by people sensitive to food. Additionally, the application of the liposomal form allows to reach target places, skipping digestive processes, which decreases the risk of a laxative effect. 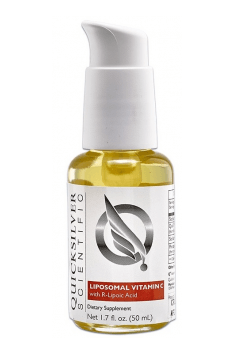 Liposomal formula that guarantees optimal bioavailability enriched with sunflower oil phospholipids. Dietary supplement containing natural lycopene. Strong antioxidant naturally occurring in tomatoes. Perfectly absorbable magnesium and potassium in capsules, enriched with the active form of vitamin B6. Capsules containing vitamin D. They strengthen bones and teeth, and calcium absorption. Vitamin-mineral supplement for sportsmen. It increases immunity, improves mood and anabolism. Professional lactic acid bacteria supplement. Five selected probiotic strains. Sodium is an important component of the intracellular fluids, and is a regulator of acid-base balance. Along with potassium affects the proper of growth and provides the proper functioning of muscles and nerves. The source of acquisition is table salt (NaCl) and bladderwrack, shellfish, bacon, beef, and of plant beets and carrots. People on salt-free diet should avoid, among others, spicy sauces and smoked meats and sausages. Sodium deficiency is very rare, at heaving sweating after a long effort (e.g. in the marathon). Excess sodium increases blood pressure (especially for the elderly), edema and increased thirst. Exceeding the daily dose of 14g a day can cause poisoning. Vitamin C (ascorbic acid) it is a vitamin soluble in body fluids, can be taken from foods (fruits and vegetables), or as drug derived synthetically. The largest of its resources can be found in broccoli, Brussels sprout, kale, black currant fruit and hawthorn, citrus fruits, tomatoes, Savoy cabbage, potatoes. In fact, intake of vitamin C of the food products does not limit the absorbed quantity. Vitamin C (ascorbic acid) is a potent antioxidant, it is an antitoxic, increasing the immune system due to the elimination of risk of bacterial contamination. Vitamin C prevents rupture of blood vessels, affects the blood cholesterol level. It substantially increases the absorption of iron. Inhibits the growth of cancer cells. Lowers stress levels. Vitamin C deficiency causes abnormal development of connective tissue, cracking capillaries, abnormal calcification of bone tissue, impaired absorption of iron, scorbutus. With the lack of vitamin C, all kinds of injuries do not heal up properly. Vitamin C deficiency can be caused by smoking; each cigarette is destroying up to 100 mg of vitamin C.
Dosage: The demand is 60-80 mg daily. It does not limit the ability to consume higher doses. Some side effects may occur only with longer taking of synthetic vitamin C.
Sodium ascorbate is an organic chemical compound that is a salt of ascorbic acid and sodium. In other words, it is a buffered vitamin C. It is characterized by much lower acidity than L-ascorbic acid, and thus does not exert such a strong effect on the membrane of the gastric mucosa. Sodium ascorbate works well in people with a sensitive digestive system, who suffer from gastrointestinal problems following administration of vitamin C in a traditional form. However, it is not recommended for people on a low-sodium diet. In supplementation, sodium ascorbate is used to replenish the level of vitamin C. It is a part of oxidation-reduction systems, protects the body against free radicals and oxidative stress. In addition, Vitamin C is necessary for the proper course of collagen production; it acts as a cofactor in the synthesis of carnitine and adrenaline and influences the metabolism of non-heme plant-based iron. Dosing: the minimum daily demand for vitamin C is 60-80mg, whereas in case of smokers, pregnant women, people exposed to stress or intense effort it is much higher. It is assumed that 1g of sodium ascorbate corresponds to 0.889g of L-ascorbic acid. Phosphatidylcholine – a group of phospholipids whose molecule contains choline. It can be synthesised endogenously in the human body, is a building block of cell membranes and thus influences beneficially their functioning. Since it is found commonly in the body, phosphatidylcholine supplementation shows many health benefits. This phospholipid has a beneficial impact on the functioning of liver tissues. It has hepatoprotective properties, consequently preventing damage to this organ caused by toxic agents, and helps treat its diseases. It reduces oxidative stress in the liver and has therefore a beneficial impact on the viability of hepatocytes. Because of the presence of phosphatidylcholine molecules in cell membranes, whose efficiency is critical to maintaining normal neurotransmission, this compound is indicated to influence positively neuronal function. It is suggested that phosphatidylcholine may be effective especially in disorders associated with too low acetylcholine concentrations in the body. It is also said to promote lipolysis. Such activity of this compound is observed only in topical administration. There are no reliable sources which describe that this phospholipid is capable of speeding up body fat loss in oral delivery. Should you arch your back during barbell bench press? And receive coupons, news, special offers and much more!